The Internship has the misfortune of being wrongfully marketed by its trailer, which sells one of the film’s throwaway jokes about the X-men movies as if it was the best kneeslapping joke in a cheap goofy comedy. 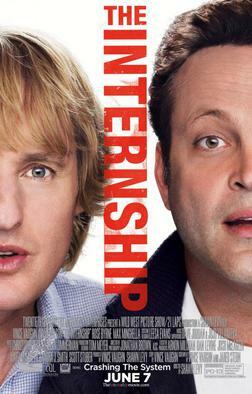 I scoffed when I saw the trailer, but The Internship isn’t entirely what its trailer represents to be. What is hidden from everybody is that it’s also partly a drama delivering a positive message about striving forward and taking risks in life. For the most part, it’s a charming comedy drama. Vince Vaughn and Owen Wilson play to their own strengths. Vaughn always had a natural salesman type quality and here he really sells that. The stark contrast between Vince Vaughn and Owen Wilson’s characters, who are old school salesmen, and the young tech-savvy geek kids is overly exaggerated. The film acts as though being an face-to-face type salesman means never coming into any contact with the internet, smart phones and have no knowledge of contemporary popular culture. This is primarily where the comedy is drawn from and it all varies from a laugh to a chuckle to no laughs. The comedy fares better when it doesn’t draw from that character contrast. One noteworthy gag was the Google team building event where they all played a faux Quidditch match. That was knee slapping hilarious. Are team building activities at Google really that much fun? In the end, the sincerity of The Internship‘s life affirming message is somewhat tainted by the fact that the film plays like a Google recruitment ad. For a viewer that may be taken back by the big blatant advertisement will probably not enjoy the film very much. It didn’t bother me much because there was just enough sincerity and laughs to pull me through the commercialisms. That is the dividing line between audiences who will be charmed by The Internship or be turned off by it, because strictly speaking it is a bit of a mixed bag. As inventor Andy Brewster is about to embark on the road trip of a lifetime, a quick stop at his mom’s house turns into an unexpected cross-country voyage with her along for the ride. Growing up as a Chinese boy in the immigrant culture of Canada, aspects of Jewish, Italian and Chinese cultures always seemed similar to me. I don’t think we are all that different after all. We are all family-oriented, express love through home-cooking, and share a deep respect for family ancestry. Subsequently, our mothers aren’t that different either; they nag and embarrass us in public and as indicated by the film’s title, they love using the guilt trip. That is primarily how I connected to the truths and comedy of The Guilt Trip. Barbara Streisand and Seth Rogen create a charming chemistry as the mother and son. Seth Rogen is a good straight man. I don’t know thing one about Barbara Streisand, her music career or seen any of her movies, but she is the secret ingredient that makes everything work. Without the charm or the truth to the way Streisand played the role, the role would have been annoying very quickly. The nagging and bickering can be grating for some audiences because of how real everything is presented, maybe to the point it doesn’t feel like entertainment. For me with my theory about Jewish, Italian and Chinese cultures being very similar, it was an insightful engaging experience watching that dynamic being acted out onscreen. That said, I probably would enjoy watching it with my sister laughing about our mother than watch it awkwardly alone with my mother. I laughed throughout the entire film. What I liked most about The Guilt Trip was how honest and real it was. The truth of the situation never precedes the humor. Anne Fletcher and her editor cut the comedy gags with discipline, the gags never outstay their welcome and all move the story forward. There are even times where there aren’t laughs. That’s where the truth pays off as it delivers some genuine heartfelt moments between the mother and son. And the heartbeat in The Guilt Trip is why I would recommend it.